Room reservations for the entire Cohen Commons for private events will not be accepted between 11:30 a.m.–2 p.m., Monday–Friday. All priority, availability and reservation decisions for Cohen Commons will be made by Assistant Director of Faculty Affairs, Jason Grocholski. These decisions are final. Cohen Commons is not available for student group private events. The use of glitter, confetti, helium balloons, candles, tape, and similar décor are prohibited. Please be sure that all deliveries and pickups for your event (e.g, food/beverage, catering equipment, etc.) are scheduled during the hours you have reserved the room. Early deliveries or late pick ups are subject to refusal if there is another event taking place in the room. Care is to be taken with the interior of the room as well as furniture, equipment and other items in Cohen Commons. Repair costs for excessive damage will be charged to your department. Compass Group is the exclusive caterer to Cohen Commons. Please contact Shared.Northwesterncatering@compass-usa.com for all of your catering arrangements. NO outside food or beverage may be brought into Cohen Commons. A licensed bartender is required for any event where alcohol is served. Furniture may not be removed from Cohen Commons. Please see the room diagram for the standard room set-up. If you require a different set-up, please contact cohen.commons@northwestern.edu. 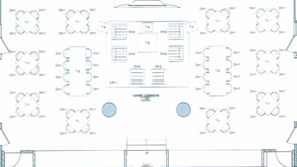 68 Chairs and 14 tables (of which 2 are community tables) are set in Cohen Commons. 5 highboys tables are also available upon request. Your Onsite Contact, responsible for the room key, may pick-up the key between 8:30 a.m. – 5 p.m. the day of your event, or the previous business day. If your Onsite Contact changes, please let Jason Grocholski know. The substitute Onsite Contact must be both eligible and willing to assume full responsibility for the event. After the event has concluded, and the room has been restored, the Onsite Contact must lock the doors and ensure that they are securely closed. The Cohen Common key should be returned to TECH L272 the next business day.